We had a pretty good turnout – 7 people total. Initial cast of characters was the regulars: Mark F, Nick, Mark S, Paul, and me. Mark S charmed the gentleman who had taken “our” table before we arrived into moving over one, and received instant karma in that he took the box initially. But then he proceeded to hold it for a full rotation of the field! About that time, Gints arrived, and so Paul and I split off to play with him at a lower stakes table. Jim showed up shortly thereafter and eventually got suckered into joining the higher stakes table. The gentleman who Mark S had charmed off chatted about literature, politics, and jokes that were funnier in other languages while we bent over our boards. The lower stakes table was pretty evenly matched – Gints held the box for quite a few games at first, but then we settled into a cycle of pretty regular turnover. Ours broke up just before 5, but the high stakes table was still going – Mark S continuing to reap the karmic benefits of his charm offensive. Here’s one position that came up that lead to some discussion about the right move. I am black and in the box, and offered a double. Was I right to do so? Would you take? 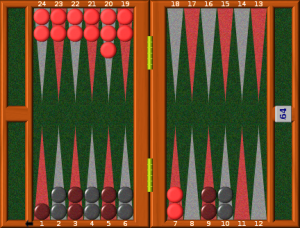 According to both GnuBG and Extreme Gammon, black is about 70% to win 70.6% or 70.4%, depending which you ask. But it’s a very minor error to double! By doubling, I gave up 0.005 in equity. Note that the gammon chances here are very low, under 1%, and so the Jacoby rule doesn’t provide a rationale for the double. So this is a No Double/Take situation. I forget what happened over the table, but I believe there was one take and one drop. Gints took a few more pictures, and if he sends them to me I will update the post with any other interesting ones. Meantime, we’re up again next weekend for a tournament – low RSVP count so far but there’s a week to go. See you there!